Tech. Sgt. Kevin Call waits to marshal an LC-130 Hercules from its parking spot on the annual sea ice runway near McMurdo Station, Antarctica in 2007. 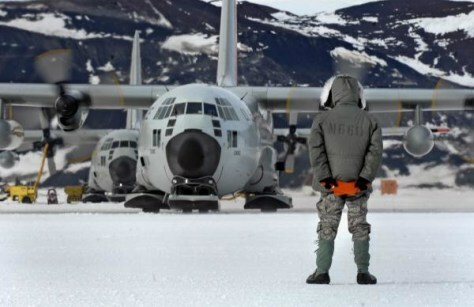 LC-130s are equipped with skis and wheels so they can land on Antarctica's sea ice runways.